Let’s say you have saved some NP and are looking for a good way to spend it. Why not try the secret laboratory? In order to get access to the laboratory you have to collect nine different pieces and put them together. After doing this the pieces are lost. After you got the map and made the pieces disappear, you have access to the secret laboratory. The laboratory can do a lot to your pet. It can either help you, or harm you. You can’t predict what will happen. The first thing you need when you start zapping is a zap pet. Zap pets I use are usually taken from the pound or created. Often they are basic colored pets. I zap them on a daily basis until they either have a color that I like or when they have turned into a species and color combination that I know someone would like to adopt. So in this way the lab ray can both be used to achieve your own dream pets or help others achieve their dreams. So let us take a look at what the Neopets lab ray could do for you. Change the gender of your Neopet. The lab ray can change the gender of a Neopet from male to female and vice versa. This will make their appearance differ. If there is a difference between clothing for male and females only the pet itself will change when the gender changes, the clothes will remain the same. So now you could have a male Neopet with the female clothing. Another thing that can happen is a change of color. Your red Wocky could turn into a starry Wocky. Most of the available colors can be zapped using the lab ray, there are even some colors that can only be gotten by using the lab ray, such as chocolate, jelly and robot. Your Neopets stats can also be changed using the lab ray. Your stats could go up and down. The amount of decrease and increase can vary and it’s also unpredictable which stats will change. Therefore your Neopet won’t have even stats, like you would get when training your Neopet at one of the training schools in Neopia. What could be handy though is getting a lot of hit points. I have seen some zap pets around that have low stats but a high amount of hit points. The species of your Neopet can also change. This could be positive when your Neopet changes in a Neopet that you like even more. It could also be negative when your Neopet changes into a species that you do not really like, in that case just keep zapping and hope for another species change. What could also happen is that your starry colored Neopet turns into a starry colored Neopet. So in that case nothing has really changed. So far about the normal laboratory. There is also a Petpet laboratory. To get access to this one you again have to buy nine lap map pieces that will disappear after use. Please note that you can only get access to the Petpet lab ray after having access to the Neopet lab ray. Petpets zapped by the lab ray do not qualify for the PPL award, but when they turn into avatar Petpets you can use them to get that avatar. For the Petpet lab ray I either use Petpets that I find doing my dailies or Petpets from my newbie pack that are left in my SDB. After attaching a Petpet to your Neopet and gave it a name you can start zapping. The Petpet lab map can do the same things as the Neopet lab ray. It can change your Petpet species, color and level. Often Petpets turn into a pile if sludge. This is a lab ray only color, just as chocolate, gold and strawberry. Some colors can also be zapped that would normally be gotten by using a cooking pot recipe, such as the moink. These Petpets cannot be found in the rainbow pool so these are also very special colors. There is however one thing that you can do with the Petpet lab ray but not with the Neopet lab ray. The Petpet lab ray could make your Petpet disappear, and have you find a new one. When you detach a zapped Petpet it will turn back into the species and color it has before the zapping, so be careful. Changing names is a last thing the Petpet lab ray could do to you. I personally do not really like these names such as Sir Bob of Geraptiku, or El Champion. So, now you know about some things that could happen to your Neopet or your Petpet when you try to zap them. It’s up to you to choose if you want to use the lab ray. The nice thing is that Neopets cannot disappear from zapping so there is no risk of losing your pet. The Petpet lab ray does have this risk so it is not advised to use the Petpet lab ray to zap expensive Petpets. Luckily there is a nice amount of cheap Petpets that can used for this purpose. If you want to try for your dream pet you can try zapping a pet from the species you like. This could be a difficulty as when your Neopet changes species you have to either find a new zap pet or morph your Neopet back into the original species. And this could be costly if you have to do it very often. If you want to try and zap dream pets for other people you also have to be lucky. The nice thing is that you can have a Neopet in a combination that you do not like but someone else does. Do find a new owner for your pet you can try the pound chat or search for petpages with lists of peoples dream pets. If you still have questions, don’t bother to ask. My pet's experience when visiting the Water Faerie after a Snowager blast. 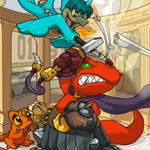 The most creatively open-ended part of Neopets might be our petpages. With no character limit and no designated themes to follow, we can do just about anything we want with these pages. You Are What You Eat...Literally?! Fear not, dear friends, I’ve listed the top ten Neopet-shaped foods, none of which contains any part of an actual Neopet.